Listen. It doesn’t matter if you’re big or small, happy or blue; having a suitable corporate identity is vital for every company. If you’re about to make a significant rebranding, or you just want to create a new brand from scratch, the oh-so-important question should always be “how can I provide all of our employees with our brand DNA?”. After years of experience in building our brand management software for thousands of established (and not-yet-established) brands, we’ve gathered extensive knowledge in the field — for your eyes only. Back in the day, when Pluto was still a planet, creating brand guidelines was a job for the professional brand and design agencies. They’d charge you a truckload of dineros for a beautiful brand book, describing your brand in full detail. But. They’d come in PDF. And. I told you, it was often made externally, which equals expensive. Not cool. Our vision at Frontify is to digitize your brand world — saving you time, effort, and those truckloads of dineros. Following the major wave of digitalization, we believe that all companies’ brand guidelines will become digital, as more and more businesses move them online. Join the digital world of brand management; more and more people are digitalizing their brand, moving away from the old mine-field of PDF-based guidelines. To reassure you that digital is the way to go; here are eight reasons why traditional brand guidelines are no longer up to the task. 1. Way too high production costs. Not only is it time-consuming to find and ask agencies to deliver your brand DNA on paper — it’s also incredibly expensive. 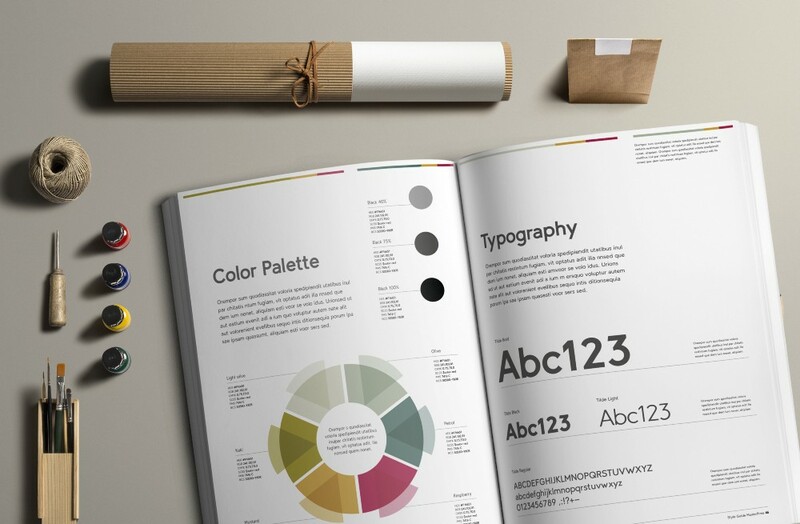 Brand guidelines for PDF/CD are created manually in your local design tool; perfection takes time. ✓ Frontify approach: Create your guidelines online. 2. Less sharable than your morning coffee. Let’s be honest. Static brand guidelines are as flexible as Gandalf’s staff. Traditionally, you’d share your brand guidelines through email. Not only will that jeopardize its quality, through compression (these files are pretty massive), but the complete idea of versioning is lost. ✓ Frontify approach: Share your brand guidelines through platform invites. 3. No connection to your brand assets. All your brand assets are sent around in ZIP files — as soon as something is changed locally (logo, fonts, pictures, colors, whatever) — it needs to change all around. Now you have to send the same files to everyone again, to overwrite them; versioning — snail-mail style. ✓ Frontify approach: Enrich guidelines with direct asset downloads (e.g. logo variations, colors, typography). 4. Dude, where’s my brand? With a static PDF, you can’t really see who’s got access to your guidelines. It’s just a digital paper that you’ve sent out, without really knowing its end destination. Who’s got the information? In which department? ✓ Frontify approach: Provide access to usage analytics. 5. Long and costly update processes. The whole process of updating your brand guidelines (if they’re static, that is), might require you to ask your brand agency, or internal design team to update it. You’ll then have to send it all out again, to all people concerned. Why? Because with static guidelines — that’s the only way to keep all involved people in the loop. And then just do it again, and again, and again to keep it up to date. ✓ Frontify approach: Change, customize, and add anything to your Style Guide — no code needed. 6. Lack of search capabilities. No one actually reads a static PDF brand book, even though they’re nice to look at. Why? It’s a hassle. Imagine if you just want to know which typography to use — I could read through Huckleberry Finn before you’re even done browsing through the logo variations. Personally, I like to be able to actively search through my files. Just saying. Digital age and all. ✓ Frontify approach: Smart search functions helping you find anything. 7. Version management? Never heard of it. Managing a bunch of different version PDF Style Guides can be tricky unless you use an external system designated to control and distribute those different versions. But you’re not done yet — you’re expected to make sure that updates reach all of the people involved, letting them know when you changed that dot over the i. Yeah, that one. ✓ Frontify approach: Your latest guideline version is always online. Instead of using templates allowing you to align your guidelines to your CI, visually, agencies often spend a tremendous amount of time creating new brand guideline templates in InDesign, or other design tools, before you can even start with the most critical work — establishing guidelines for everyone. ✓ Frontify approach: Providing a selection of brand guideline templates. No brand is static - living guidelines is key. No brand is made to be static, in this day and age we’re obligated to let our brands evolve as a part of the digitalization. As a matter of fact; brands never stop evolving. You might be making new projects, adopting your corporate design, or anything that challenges your brand to go full chameleon on its surroundings. Things like these are common and require a flexible, quick, and efficient environment for you to adopt changes quickly. Guidelines are just the start, but a solid one! In the future of CI guidelines, we’re not going to be limited to merely having brand guidelines online — larger and more complex brand systems are becoming a reality. This will include digital UI Pattern Libraries, Brand Portals, and a much more efficient collaboration between employees and external partners. Welcome to Frontify.